GSMArena team, 22 November 2012. The Xperia J comes with the new Sony gallery, called Album, which is now available on most Ice Cream Sandwich Xperia smartphones. You can download a video player off the Google Play Store with support for more video codecs but chances of getting a high-res video to play smoothly are pretty slim. The Sony Xperia J is equipped with an FM radio, which has a neat and simple interface. It automatically scans the area for the available stations and places "notches" on the frequency dial for easier scrolling to the next station. 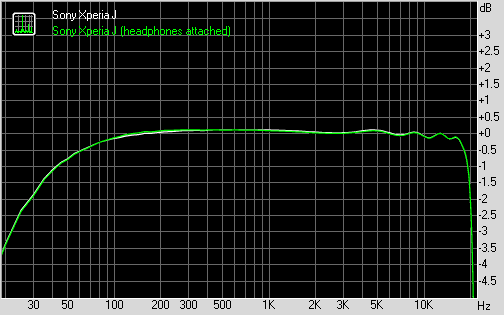 The good news is there's little degradation when headphones come into play. Stereo crosstalk rises only a little, but remains quite good. Remarkably, the distortion actually goes down and is better than many other smartphones we have seen. A pretty good performance for this case, and it would have been excellent if it wasn't for the very low volume.